I’m reblogging this here quite simply because it’s the best piece of writing I’ve come across on this subject. As usual Karen finds ways to highlight the importance of subtle issues others mostly miss (e.g. “My mother came too close to knowing. “) Such a powerful personal anecdote from someone so knowledgeable and experienced in this field is worth its weight in gold. I am a reunited adult child. For thirty years of my life I was alienated from my mother. I am reunited now. As a result I am no longer wrestling with demons and ghosts. I was used by my father and his mother, to replace the girl child she had never given birth to. She took me and he let her, as compensation for that. Imagine: a child you know loses a parent through illness, accident or military conflict. What would you expect to see? You might expect to see an overwhelming sense of loss, of grief. You might expect family and friends and others to rally round with emotional, practical and other forms of support. You might expect the grieving process to go on for some time. You might expect to see a grief-stricken parent struggling at times to muster the energy to be strong for that child, yet always instinctively driven to put the child’s needs first. You might in time, expect to see signs of a return to some new form of normality. You might dare to expect; to believe, that this child will grow into a well adjusted, contented and responsible adult and parent. You’d not I imagine, expect to find all pictures of a dead parent gone within days of the funeral. You’d not expect, within weeks, to find a child claiming to have no happy memories of that parent; to be engaged in a campaign of denigration, expressing hatred of someone so recently loved and valued. You’d not expect the remaining parent to subsequently claim this child was doing much better now precisely because the dead parent was no longer part of the child’s life. You’d not expect the child to say the lost parent wasn’t missed or thought of at all, or for the child and remaining parent to seem to consider all this perfectly normal. Yet this is what can and sometimes does happen when a child loses one parent, not because that parent has died, but because the other parent wants to complete the removal of an ex-partner in every respect possible, from their lives. It normally comes to light after separation, but the process can start within intact families; with one parent seemingly trying to compete with and continually put down and belittle the other, often in very subtle but manipulative ways. It’s not always so severe and in some cases it can be short lived until the heat and pain of a break up starts to subside, or the parents are worn down by or come to accept some inevitable consequence of the legal process. 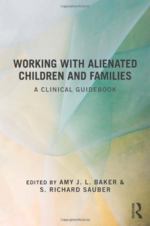 Even then though, the underlying cause is likely to linger and have a lasting effect on the child as one or both parents, sometimes inadvertently, undermine and disrupt that child’s relationship with the other parent. So, given how starkly these behaviours contrast, why is there such acceptance of – even support for – the behaviour we see when some parents separate, when we so instinctively know we must act in the best interests of children faced with such trauma? Children simply don’t have the means to understand or cope with such traumatic events alone; all they feel is the loss of someone they love and a deep sense of vulnerability about who’s going to care for them now. In bereavement we reinforce how much their lost parent loved them and assure them they’ll continue to feel that love even though the parent is gone. We encourage them to cherish the good times they had and to talk about the parent they’ve lost. We help them treasure those moments and feelings and possessions that hold special significance. We ensure they can still keep in touch with the lost parent’s family; with grandparents and aunts and uncles and cousins, because there’s a part of the lost parent in them, just as there is in the child. We ensure they feel safe and cared for and loved; we tell them nothing will ever change that. We do these things, often without anyone having to tell us, desperately hoping it’s going to be enough to get this child through the pain. We do them because we fear if we don’t, that the child may be scarred by such a traumatic event. These are vital ingredients in a child’s grieving process, recovery and future wellbeing. So what consequences for children who, instead of being helped and supported through grief, find the grieving process denied them as the loss of their parent is contrived and celebrated? There are no perfect parents of course; most work hard in the hope they’ll be “good enough”. Most parents who separate, manage that well by putting their children first. Even when circumstances mean it’s really difficult for them; as parents they work hard at that too. Many would much prefer to leave the past behind them and move on with their lives, often with good reason; be it guilt or anger or pain, but they resolve this dilemma well away from their children; taking care to infect them only with contagious reasonable behaviour. Some parents are not so initially reasonable, or the extent to which each of them is may differ. Family and friends and others may influence them and provide a more reasonable view for their children. Sometimes mediation or counselling provides the neutral and balanced perspective to draw them back to a more focused view and for others it takes the advice of a lawyer. Some need the courts to decide for them, and whilst one or both may never entirely agree with the outcome, most – with their families – go on to make that work in some reasonable way for the children too. It’s important to recognise there are families where parents, even children have suffered or witnessed abuse. If there’s any chance of risk of abuse then it must be given absolute priority; with thorough assessment and careful management. In these cases, the best interest of the child welfare standard, normally applied to test that solutions follow our informed presumption: children should have both parents actively involved in their lives, is only considered once courts are satisfied they will not face risk of abuse. It therefore follows where there’s risk of abuse; delays must not force these families to mediate or leave them exposed to that risk. These families need to be quickly identified so the appropriate agencies, with the courts, can intervene without delay. Abuse is so unacceptable that these families must be the priority and courts must have effective measures to deploy to support them. When cases present where one parent has stopped contact; not because the other parent is a risk, but because that parent seeks for themself the priority others require, swift identification of children at risk of abuse becomes more complex and scarce court resources are spread thin. If that parent seeks only the status this priority suggests, not the rapid intervention it sets out to provide; the parent’s best interest will be served if the court is forced to explore; not issues of welfare and safety, but details of the other parent’s imperfections. If a child’s unyielding campaign holds the spotlight on the other parent’s imperfections, the legal process can take months, even years as courts examine those imperfections in detail to discover the reaction exhibited is disproportionate to the child’s actual experience with the other parent. The child does not exhibit post traumatic stress symptoms associated with exposure to physical or sexual abuse or extremely compromised parenting, but another quite remarkable disturbance that should not be ignored; yet the significance of that disturbance is seldom acknowledged, nor the source isolated, and so the original suspicions may linger. Since the child can appear to be doing well in other aspects of life, a court may decide not to disrupt the status quo; allowing the passage of time itself to deprive the child of a relationship with both parents. What manner of thinking could allow [custody evaluators] to imagine that a child whose affections have been poisoned against a loving parent or grandparent is doing reasonably well? Are there any parents in the audience who would agree that their children were functioning reasonably well if they expressed the firm and stable desire to have you leave their lives forever? Would you accept this situation so long as your child made good grades in school, had friends and was not an arsonist? Obstacles & Controversies in the Pursuit of Children’s Best Interests, by Dr. Richard A. Warshak. Based on a keynote address at the Arizona chapter of the Association of Family and Conciliation Courts, 4 February 2000. The question too infrequently asked of these parents who stand back and defend a child’s right to choose – perhaps because it is so apparent anyway – is why there has been no mention or sign of any serious intention to encourage that child differently. At the least, it’s clear these parents omit to consider, support and moderate the child’s need for contact and love with their other parent. It’s so difficult to comprehend that some parents might systematically and unreasonably portray the other parent as all bad, and themselves as all good, with the conscious or subconscious intent that their children are persuaded to be wholly loyal to them and wholly disloyal to the other parent, that we dismiss it as unthinkable. However we must be prepared to suspend disbelief long enough to discover how the wealth of international thinking and research can enlighten us now. Parents who try to alienate their child from his or her other parent convey a three-part message to the child: (1) I am the only parent who loves you and you need me to feel good about yourself, (2) the other parent is dangerous and unavailable, and (3) pursuing a relationship with that parent jeopardizes your relationship with me. In essence the child receives the message that s/he is worthless and unloved and only of value for meeting the needs of others. This is the core experience of psychological maltreatment (emotional abuse) as defined by the American Professional Society on the Abuse of Children (APSAC). Most complex but important of all, might be for us first to find a more sympathetic understanding of what makes a few parents so determined to do this, when there is little or nothing to otherwise justify it. Why is it so important for them to so completely erase the other parent from the lives of their children? The next post in this series will consider that question. This is the second in a series of posts exploring this issue. 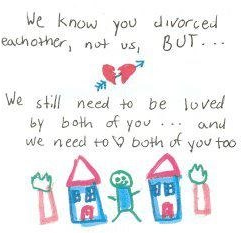 “Dear Judge: life’s perfect with this parent & I don’t want any contact with the other one.” That’s the essence of what judges can be faced with, having asked for the views of a child when the parents are unable to agree about contact (or residence). In reality, neither judges nor professionals make much sense of cases like this. Often judges simply decide not to disrupt the status quo. The child’s strident views are not the only factor. Typically the resident parent will defend the child’s right to make his or her own decisions and reports will show a pupil doing well at school. There might appear to be no signs that would give rise to concern for the child. What’s puzzling in many cases is neither are there concerns about the parent seeking contact. Yet, “there’s no smoke without fire”, is probably a common, if unspoken assumption. “Feckless parent” is likely to be another. If you’re a parent yourself, or ever expect to be one, the thought there’s simply no way your child would ever reject you will already be front and centre of your mind as you read this; something even judges are not immune to. If you think this could never happen to you, you’re probably right. If you think it’s true because you’re a decent person and a caring, responsible parent: that your bond with a child could never be broken, you may well be mistaken. You might be surprised to discover these selfsame characteristics in many of the parents rejected in this way. The factor determining their rejection will most likely have been their initial choice of partner. The patterns in both parents’ upbringing are probably what prepared them so well for each other. The child’s view summarised in the title here demonstrates complete lack of ambivalence (one parent is all good, the other all bad). 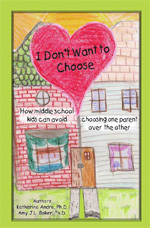 What causes a child to so comprehensively reject a safe parent who, pre-separation, was loved and valued? With what this child reveals, it’s a good thing those views were sought, but will anyone recognise their significance? What do judges do with the information this intrusion into the life of a child yields? What is their motive in asking for those views in the first place? Is it to increase understanding before making decisions; or as the basis for decisions in situations that seem to defy explanation? Worse still, are these views (which often mirror what one parent is seeking) used to justify pressing on with decisions based on the unspoken assumptions mentioned above? The public face of these cases is all too familiar. Television and radio interviews with parents or grandparents who’ve not seen or heard from a child in years. This scenario is almost familiar enough for it to be considered simply one of the risks of separation. The public face of this issue is all about those who’ve been rejected, and that’s a perfectly valid topic to explore and discuss, but let’s be clear: it’s not the core issue. The core issue is the long term welfare of the child. The paramount issue at law is to pursue the best interests of the child. The ultimate role of the judiciary is to protect the child from abuse. So, what about these childrens’ interests and welfare? What’s being asked of them? 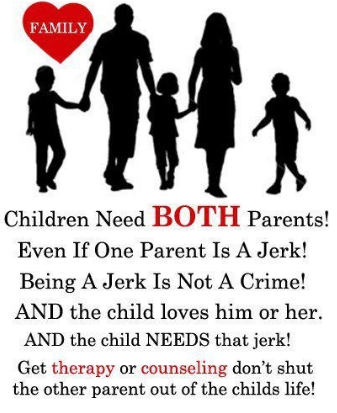 Don’t the adults involved (parents, professionals, judiciary) have a shared responsibility to ensure children are not having to choose one parent over the other? Are those adults each taking responsibility, thinking clearly and doing all they can, or are they inadvertently leaving the children, by default, to resolve that impossible predicament themselves? Children have simply not even begun to develop the means to enable them to deal with that. What they need is to feel cared for; they need to feel certain there’s someone, preferably both their parents, available to them to keep them safe and provide their care. The more convinced they are (from how they see them behave) that both parents are committed to that, the more secure and safe children will feel, and the more likely they’ll flourish. When children are exposed to a culture of blame; when they witness a parent engage in adversarial behaviour fuelled by unmanaged emotions and black or white thinking it undermines the security of their fundamental care. They may sense they’re expected to assume responsibility for that parent’s well-being; that unquestioning loyalty is required of them. 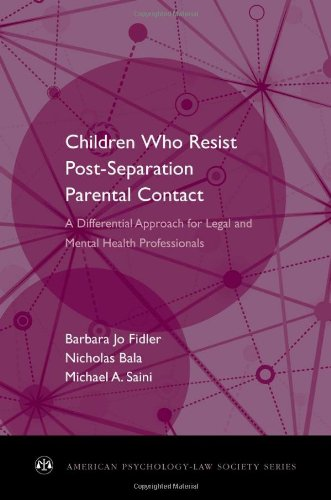 Where children are isolated from one parent because the parent they’re living with prevents contact, a powerful undertone of conditionality can be established. In the time it takes to get to court – then for the case to be determined – there’s unfettered opportunity to infer that the other parent is somehow unloving, unworthy, unavailable; even potentially dangerous to them. And of course it’s very easy to spook a child; to tell them there’s a monster in the cupboard that’s going to eat them up. And when this happens in play, you can reverse it back to normal. But if you don’t reverse it: even (or especially) a person who was previously trusted might be sustained as a very dodgy, avoidable one. Some children are so overwhelmed by the threat of withdrawal of support by one parent (who by this stage they’re convinced is their “last hope parent”), that to avoid it they subscribe to that parent’s version of reality in which the rejected parent is the villain and the parent they expect to be living with is the hero-victim. These children submit to the parent’s reality as the price of admission into that relationship, and they pay that price – as children often do – without questioning. Most children cannot bear the thought that a parent is hurting them and will do almost anything to avoid that reality. 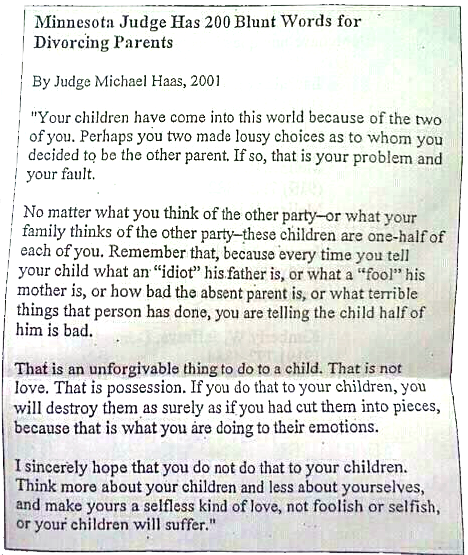 This is the context in which some childrens’ views are sought: placing them in the position where the outcome of the parents’ dispute hinges on what they say. The law rightly intends that children be given a voice in matters affecting them, but it was never intended that the onus for decisions should fall on them by virtue of being given that opportunity. Consulting children is often challenging and complex and mental health professionals are trained to avoid the pitfalls; including the risk of countertransference (their own emotional reaction to what they’re being told), so it’s not unreasonable to expect those carrying out this sensitive task to be appropriately trained. In Scotland however, it’s normally Bar Reporters or Curators ad litem who speak with the children and report to the court. Typically, family lawyers are appointed to these roles (where the duties and powers are poorly defined), but no specific qualifications are required; no training or best practice guidance is provided and there is no monitoring or supervision of their performance. Most have not undergone training to interview children; yet their reports and recommendations are often heavily relied upon by the Scottish judges who appoint them. In cases where qualified professionals are involved, their opinions are often picked apart and used out of context in an adversarial system where each solicitor has a duty to their client (the respective parents). Since these caring professionals must – as court appointees – be seen to remain impartial, neither the parents nor their children benefit further from their insight or support. This in stark contrast to the collaborative way these professionals normally work; where they provide ongoing support as part of a plan agreed together with the other professionals and agencies involved. It’s little wonder then that so few are prepared to have their professional opinion misrepresented or discarded and stand by as the children fall right through the middle. This culture will neither attract nor retain bright minds in the caring professions; whose contribution is so desperately needed to increase understanding of – and help develop solutions for – these troubled families and particularly for their children. This culture may be so abhorrent to them that many steer away from what they might otherwise be keen to learn from their colleagues abroad; colleagues who’ve already made substantial progress in this field. Until there’s resolve to learn more from outside Scotland and the rest of the UK and from other disciplines, some family courts will continue to dismiss or simply fail to recognise even the more obvious signs – such as those in the case outlined here – that something is very wrong. Those ideas and discussions must continue and expand to encompass the wealth of international thinking and research that’s already been done. The Child and Family Psychiatrist who spoke at the Changing the Culture seminar, has assembled key literature in the field for those who want to learn a little, a lot or much more. With these reforms comes an opportunity to create a more enlightened and integrated family justice system in Scotland. Thinking that’s focused more clearly on children than polarised, strongly gendered narratives or assumptions, will lead to a culture of understanding in which far fewer children will be left to resolve these painful issues for themselves. This is the first in a series of posts exploring this issue.